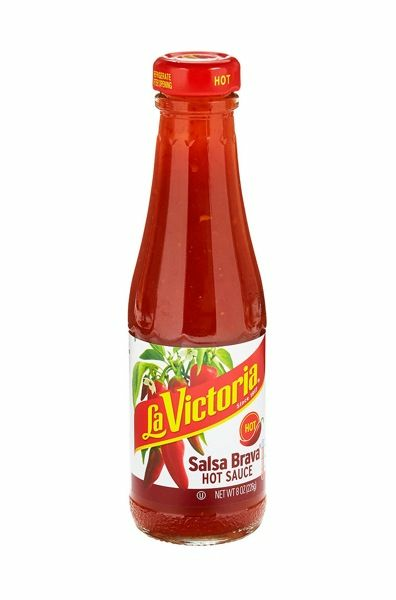 Salsa Brava La Victoria is the hottest taco sauce that La Victoria sell. Great for spicing up your favorite dishes. Pour it on shellfish, soups, broiled meat and poultry for an added zing. La Victoria Salsas: Authentic Mexican Foods that taste great. La salsa brava de La Victoria es la salsa para tacos mas picante que maneja La Victoria. Es deliciosa para darle sabor a tus platillos Mexicanos favoritos. Usala en mariscos, ceviche, sopas, carne asada y pollo al gusto para darle un sabor picoso a tu comida Mexicana. The absolute Best Taco Sauce Ever! I have grown up on taco's family night. All taco's made from scratch. Fried corn tortillas in oil with any meat! White onion, lettuc, tomatos, shredded sharp cheddar cheese and La Victoria Bravo! With mild green sauce! Amazing Memories and still today!! Love This! This is our all time favorite hot sauce. Since we haven't been able to locate it in stores in several years, we order a small supply directly from MexGrocer whenever we need to restock our supply. It arrives promptly. We highly recomment this product and this company. We discovered this creamy delight while living in San Diego. So much better than those watery sauces. The only hot sauce my family uses. Unfortunately we are unable to locate it in our local stores here in Pennsylvania. Thank goodness for online purchasing! ProsFlavor , texture and flexibility. Been buying for many years. My husband puts it on all the Mexican dishes I make. Can't find it locally, so I order it for him. If you like "hot", this one's for you. Smooth and lots of kick! Have bought this sauce for years but for some reason can no longer find anywhere close to here. Found your website and received my purchase promptly and in great condition. Plan to order other items from you. This sauce is the best.....spicy but not ovet the top. I love this sauce on tacos, burritos, eggs, omelettes, etc. I've been using this sauce for 15 years and if they ever quit making it, don't know what I'll do! No vinegar taste. Try a bottle and you'll love it! I love this sauce over eggs! Can't find it in New England! This is a perfect Sauce!! This is the best taco sauce you can buy. I have been using this product for over 10 years and I love it. It is hard to find the hot sauce in stores. I have to order it direct from the manufacturer. This has been my "standard" taco sauce for over 30 years. Sometimes I have a different sauce on my taco, just for a change, but I always come back to Salsa Brava. It's the best. Just as delicious as I remembered! So happy to find this site. Delivery was very prompt.